Did you know that June is National Acne month? Let’s face it, no one likes acne, especially adult acne. There are so many products out there to choose from but if possible, I try to opt for a natural solution. 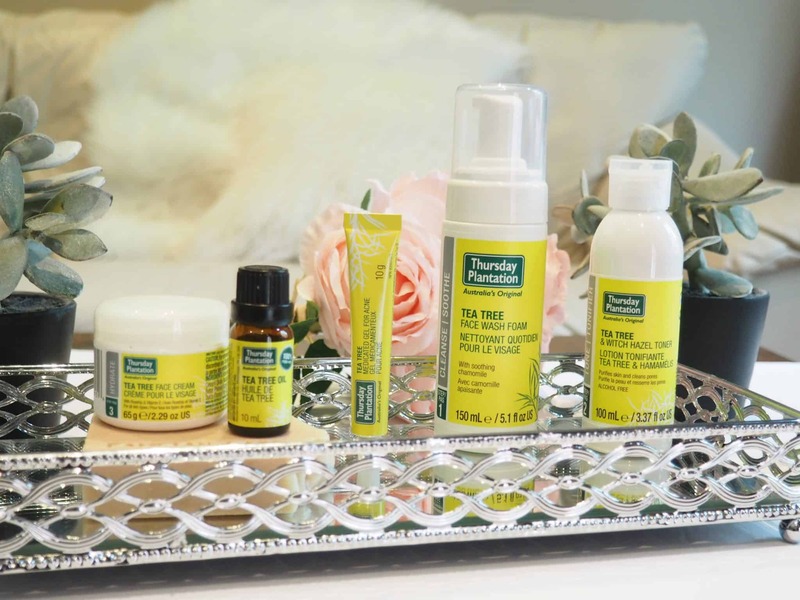 Thursday Plantation is the first Acne range in Australia to use the antibacterial power of Tea Tree Oil. I love Thursday Plantation products. You can read about the Essential Oils Rescue Kit here. 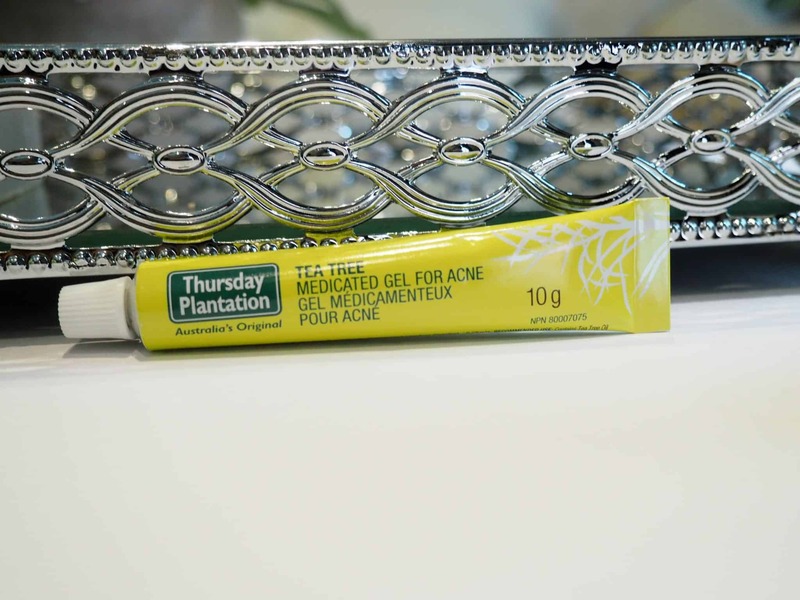 Thursday Plantation has a specialized 3 step program to maintain a clear complexion, naturally. 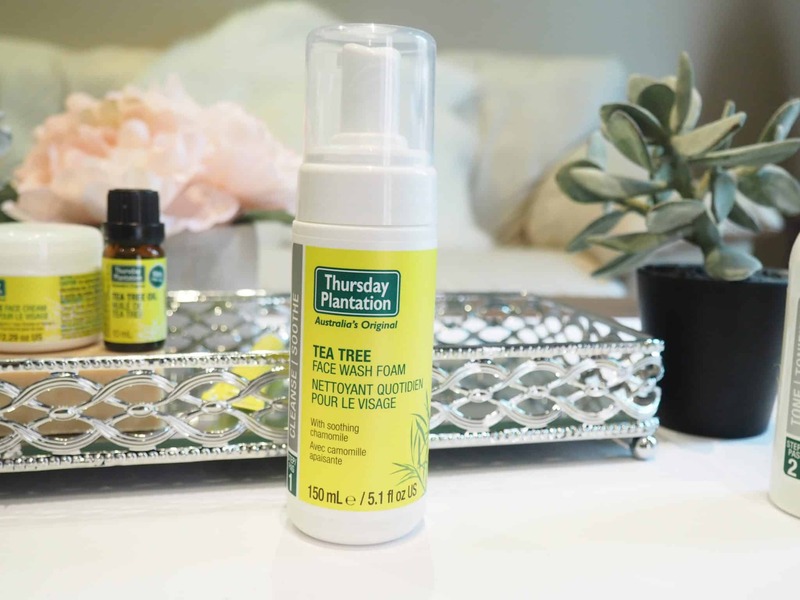 Thursday Plantation Step 1 Tea Tree Face Wash Foam is a natural soap-free foaming cleanser. This all natural soap free, foaming cleanser helps remove the build-up of oils, dirt, and makeup without stripping the skin of its natural oils. It leaves the skin looking clearer, fresher and healthier. The foaming, soap-free face wash is ideal for combination/oily skin and helps to cleanse acne-prone skin. It is made with calming Chamomile to help soothe skin redness. Although initially this kit was meant for my daughters, I found myself reaching for this cleanser often. I liked that it actually removed my makeup and made my skin feel fresh and clean. 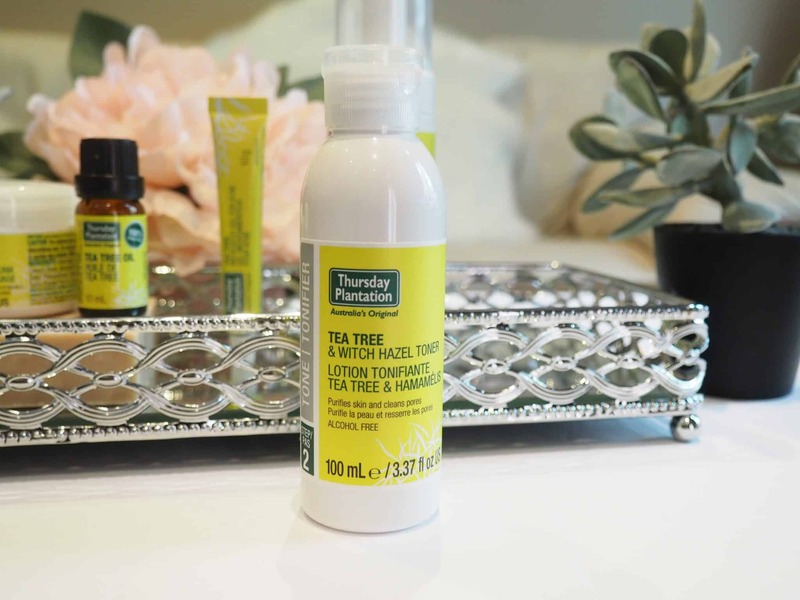 Thursday Plantation Step 2 Tea Tree & Witch Hazel Toner captures the antibacterial power of tea tree oil and the toning benefits of witch hazel to purify the skin and tighten pores without over-drying. I actually love using witch hazel as a natural astringent to tighten the pores. This toner contains 100% pure Australian tea tree oil, a natural antibacterial ingredient that removes excess oil and bacteria and is made with soothing aloe vera and calming lavender. 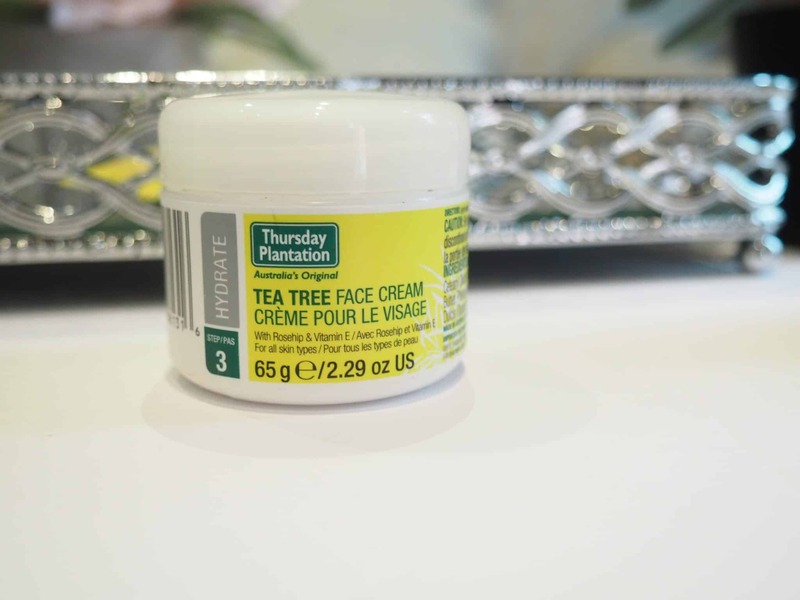 Thursday Plantation Step 3 Tea Tree Face Cream with Rosehip is a lightweight face cream that combines the antibacterial power of tea tree oil with natural, skin-loving ingredients to moisturize and maintain clear skin, naturally. Like the other products, this cream contains 100% pure Australian tea tree oil to help maintain clear. This cream also restores the skin’s natural moisture balance after cleansing and toning and contains a blend of natural moisturizers including macadamia oil, rose hip oil and Shea butter to restore the skin. I know most people fear using a moisturizer as they think the added oils will break them out. I have found the complete opposite. I find my skin will break out if it is excessively dry. The natural oils help to restore the moisture in my skin leaving it feeling fresh and youthful. When I have a break out I want to get rid of it as soon as possible. This mediated acne gel is an invisible treatment that helps treat whiteheads, blackheads, pimples, and acne. I dab this on a breakout and I find that it clears it up pretty quick without drying out my skin. Tea Tree Oil is a go-to in my house. We use it for everything from zit breakouts, to minor cuts, abrasions, bites, and stings. I even use it as part of a natural household cleaner that kills 99.9% of household germs. Thursday Plantation products can be purchased at most health food stores or online here. Thank you Thursday Plantation for the wonderful products. Do you suffer from pesky breakouts? 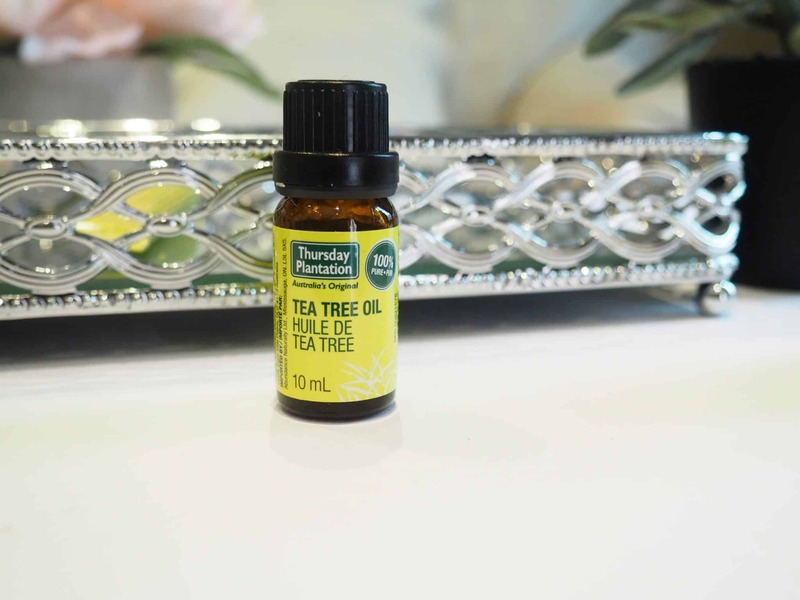 Have you tried Tea Tree oil?